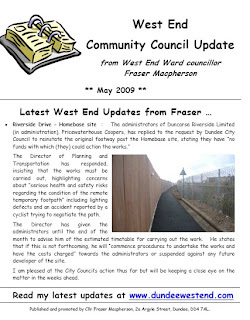 If you click here : http://www.dundeewestend.com/2008/05/seagulls-nuisance.html, you can read the blog story I wrote back in May about residents’ concerns regarding seagulls – particularly in the areas of tall tenements south of the Perth Road shopping area. Seagulls appear to thrive on litter/rubbish and their aggressive behaviour towards other birds, pets and even people is a real and increasing problem in our cities. It is an increasing problem, and I met with residents and an officer from the City Council’s Environmental Health and Trading Standards Department on 6th August to discuss measures to discourage seagull colonies from nesting on the top of local tenements. I am pleased that Dundee City Council has taken a proactive approach in assisting residents with tackling the seagull menace. I was advised by the City Council officer that, on 24th June, a nationwide meeting was held in Dumfries to discuss seagull problems in urban areas. This was a positive move, giving residents, business operators, environmentalists and the Environment Minister a chance to meet and exchange views on how to tackle the problem of seagulls in Scotland’s coastal towns and cities. To ask the Scottish Executive what action it is taking to address the growing problems caused by seagulls in urban areas. To ask the Scottish Executive whether it is planning changes to legislation in order to assist local authorities in tackling the problems caused by seagulls. 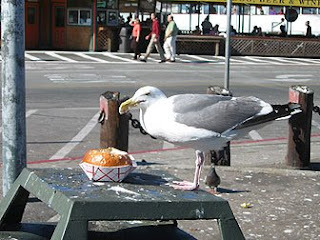 To ask the Scottish Executive what additional funding it will give to local authorities in order to assist them in tackling the problems caused by seagulls. The bottom line, in my view, is that Scottish Government has to tackle the inadequate legislative situation and, fundamentally, has to properly fund efforts by local authorities to assist residents with the problems seagulls cause. The Environment Secretary’s “Task Force” announcement is to be welcomed but, fundamentally, residents in the West End and in other urban centres in Scotland need real assistance and this requires a review of legislation and proper targeted funding from Scottish Government to local authorities to help them properly tackle the issue. I’ve obtained the assistance of City Council Environmental Health Officers following complaints from residents about seagulls noise in the early hours. I contacted the Head of Environmental Health and Trading Standards about the problem, following constituents being kept off their sleep by the noise of gulls nesting on tenement buildings in parts of the West End, particularly on some of the tall tenements south of the Perth Road shopping area. I have been councillor for the area for seven years and each year the number of complaints about this problem in the area has increased – particularly in the past couple of years. 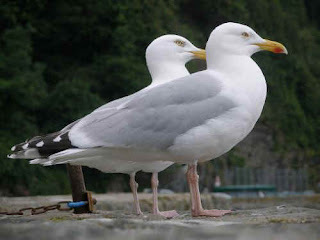 Residents are sure that the gull population has increased as they have been displaced from their old sites such as the docks area and various some previously decaying industrial sites which have been since redeveloped. The Head of Environmental Health and Trading Standards has very promptly responded with advice and offering to speak with those residents who have raised concerns. In the City Council response, it is accepted that the “ongoing impact of gulls” is partly due to being displaced through derelict properties being modernised/replaced and the Council’s efforts to reduce readily available food sources in the city centre area, and this has exacerbated the problem in the West End but there may be other contributory factors. I’m pleased that the City Council recognised the problem and is willing to assist residents with the issue.